The Dam crossing in the Amsterdam city centre. While job hunting and enjoying the weather of this Saturday I stopped at Dam Square. On the 18th of July the sunny weather made cycling and walking around a pleasure. On the way back a short stop at Dam Square was a good opportunity to make some pictures for a topic that was on my mind, surviving Amsterdam traffic. I live in the Amsterdam region since 2009 as a student. The facts speak for themselves. Current Amsterdam is an old city built on Medieval foundations around a compact city centre that once had canals and defensive works. The old city centre is largely intact and current traffic needs more space. At the same time the old city and its cultural heritage make Amsterdam interesting as a tourist destination. So the old city centre is maintained. To get from A to B there are two approaches.There is the slow and relaxed approach. In the city centre going fast is difficult due to many obstacles and bottlenecks. After years of racing through the city I slowed down as going faster was not worth it. Slowing down I would still arrive on time and staying more relaxed also made life and work more pleasant. Then there is the fast and tense approach. This approach reduces the city centre to a cross circuit. Everybody who is too slow becomes an obstacle. Everything that stands in the way becomes an obstacle. The bell rings quickly to signal living creatures to make way. Overtaking, cutting corners and skipping cues are things you constantly do. Being exposed to the somewhat controlled chaos of Amsterdam my reflexes are used to surprises around almost every corner in sight, on foot and bicycle. You adapt. When I am in a quiet city or village I notice the immediate relative silence. Sometimes it is simply uncomfortable for me. To survive the Amsterdam traffic it helps to not be in a hurry. The city centre is filled with people and objects that can constantly get in the way. From Central Station to the Prinsengracht everything is within short walking distance. Add public transport and rental bikes and you can cruise from A to B. If you ever go to Amsterdam do not rush. Keep your eyes open and slow down. 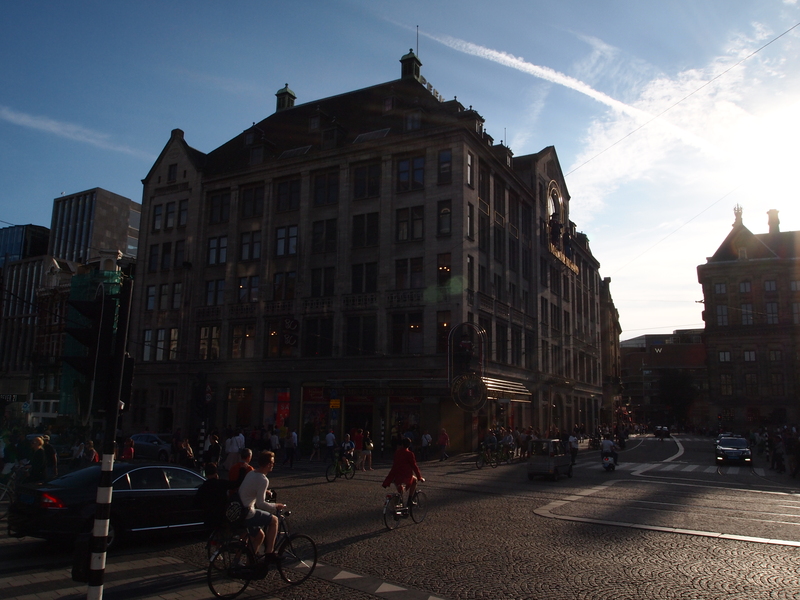 Dam Square on a warm Saturday evening. 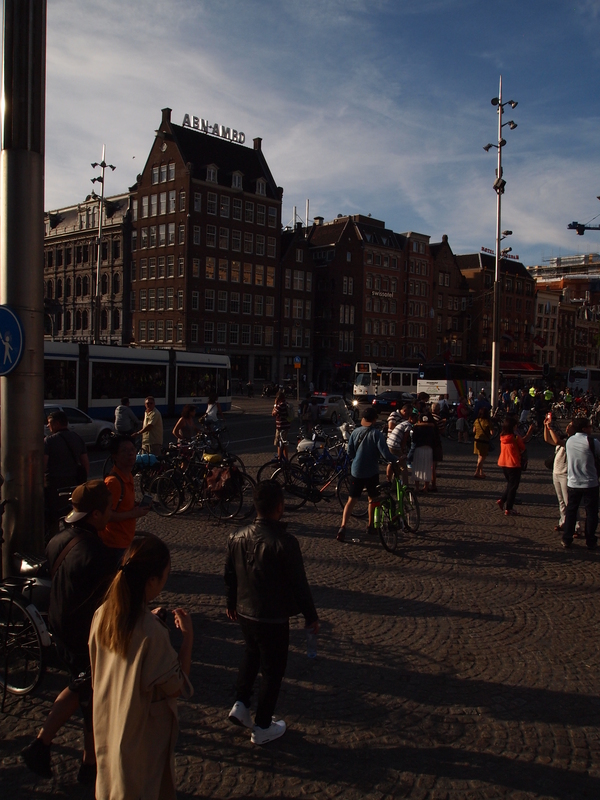 Posted in Short Reads and tagged 18-07-2015, Amsterdam, bottlenecks, chaos, city centre, cultural heritage, Dam Square, fast and tense, life, Medieval foundations, obstacles, reflexes, saturday, short walking distance, slow and relaxed, sunny weather, surviving, tourist destination, traffic, work on July 19, 2015 by rura88.